Is the name derived from the Korean word "bop" for rice, as in Bi Bim Bop? I'm a big fan of bopNgrill. In spirit, it reminds me of Big & Little's, high praise indeed. Nice people turning out high quality, interesting food at a good price and having fun doing it. The place has a pulse. Foodsnob77's mention of the kimchee burger caught my attention and in fact was the reason for my first visit. It didn't disappoint. From top to bottom: tomato slice, shredded cabbage, fried egg, white cheese, kimchee, patted-to-order griddled burger, bacon, gochujang, all on a nicely toasted sesame seed bun. That's one crazy burger. There's an awful lot going on (perhaps too much) but I enjoyed it quite a bit. Maybe the messiest burger in memory, it was constantly squirting, oozing and dripping. Not a complaint. I was nearly halfway through before I realized that there was a damn fine burger underneath all that stuff so I resolved to return for a simpler rendition. I also tried a Philly steak eggroll and was especially impressed by its presentation. I've never seen a $2 fast food item plated with such flair and care. I liked, but didn't love, it. I think the eggroll might have suffered being eaten after the kimchee burger, with its mix of strong flavors. In contrast, the eggroll seemed a little dull and heavy. I wonder if a little acid somewhere might help a lot—maybe a simple citrus or vinegar dressing on the cabbage or some sort of pickle alongside. Other offbeat eggroll choices—short rib, mac & cheese, corned beef hash, hot fudge brownie etc—ought to be worth a try. Next visit I kept it simple—just a basic burger and fries ($4; an extra $1.50 gets a generous pile of fries plus a drink). Indeed an excellent burger—large, loosely packed, griddled to medium-well but still juicy. Good grilled onions too. The French fries are at least as impressive—fresh cut from Idaho spuds and twice fried. Really top notch. Evanston is a hamburger Mecca. It was tough to decide which rice plate to order but I settled on garlic shrimp. With the shrimp, that's a couple scoops of nice sticky rice, a mound of their terrific fries plus a cabbage and radish salad. Sort of an odd combination but it works. The shrimp and garlic juice soaking into the fries made for some spectacular bites. I'm not the biggest fan of 1000 island dressing (and it was applied over-generously) but somehow it all worked together. I can't wait to try bopNgrill's rice plate with short ribs. I'm not sure if it's a classic kalbi preparation or some variation but I have faith it's tasty. Like I said, I'm a fan. ChgoMike wrote: A kimchi burger, if done well, has the possibility of being one of the finest edible concoctions in my personal palate book. Can't wait. They deliver, according to their Facebook page. I hope you like it as much as I did (not everyone will, I'm sure). Next time I might try to order a simplified version, without bacon or egg. That might highlight the kimchee more. I wonder if getting a kimchee burger delivered is a good idea. I have a feeling it would suffer quite a bit in transit. d4v3 wrote: Is the name derived from the Korean word "bop" for rice, as in Bi Bim Bop? I believe that's correct. The menu board behind the counter is divided into four sections: Bop Plates (served with rice and fries), BNG Specials, Burgers and Eggrolls. In case anyone is wondering, there's no connection to any other restaurant with "Bop" in the name. I was relieved to know the owner wasn't associated with the miserable Bbop Lounge on Sedgwick (now closed). I went up to bopNgrill for this first time today. I ordered the kimchi burger, sans bacon and cheese, with fries. It was excellent. The meat itself looked hand-formed and was loosely packed, not densely crammed into puck shape. I'm glad I didn't order the cheese or bacon, this time, because I was really able to taste the items that made this burger different than others. Good kimchi flavor, nice cabbage crunch, tangy gochujang, a relevant fried egg and a bun that held together under the duress. It all worked very well together. It was the tastiest burger I've had in a long time. As previously mentioned, the fries were surprisingly crispy - they help up well in the drive home to southeast Evanston. Very lightly seasoned. I would have liked the option of more gochujang to go with the fries, but I bet I could have gotten some had I eaten at the restaurant. I arrived at lunchtime and there were some loud high school students hanging around, which isn't surprising since the restaurant is across the street from a high school. I took my order to go. The owner, Will, asked where I had learned of the restaurant and I mentioend LTH. He hadn't heard of us (shocking, huh?!) and I described the site as an educated Yelp. I'm not sure if that's an accurate or fair description, but it's what came out at the time. He said that business has picked up since opening eight months ago and the best seller is the short ribs. He seemed surprised that the Korean food was going over so well. I'm not surprised. I can't wait to try more of their offerings. Excuse my ignorance but could you explain what a Kimchee burger is. Is it hamburger meat combined w Kimchee...does it create a unique taste....etc., etc. First I've heard of it and BNG is right down the street so will give it a try. Thanks to you and Renee for making me want to stop. I think it's pretty much a regular hamburger with chopped up kimchi within the meat. The other toppings are all optional. The kimchi is inside... where it's warm and yummy. The comfort of a burger and the zing of kimchi. I believe that's correct. The menu board behind the counter is divided into four sections: Bop Plates (served with rice and fries), BNG Specials, Burgers and Eggrolls. In that case +2 points for a clever name and +2 points for unpretentious Korean-American fast-food fusion. bopNgrill moves up my bucket list. It does seem that ETHS has gotten the off-campus loitering issue more under control than in the past. Unfortunately, people see a bunch of teens hanging out on a corner and automatically a big red flag goes up (sometimes justifiably). Now that school is out for the summer, that intersection is probably pretty tame. Rene G wrote: I also tried a Philly steak eggroll and was especially impressed by its presentation. I've never seen a $2 fast food item plated with such flair and care. There seems to be quite a run on BNG lately. I happened to be there yesterday (before ReneG's post).. and, since I wasnt that hungry, tried the mini-Angus, the short-rib-eggroll and, when I saw that they were fresh-cut, the fries. Nice place in general, tho it didnt blow me away. The presentation on the eggroll was similar to yours - very impressive. It didnt blow me away either, but was good nonetheless.. freshly fried etc (tho I had taken it to go, to be fair). The mini-angus-burger was good too.. enough to make me want to try a proper-sized one the next time (and there will be a next time). The fries were very good too (Evanston is spoiled by its fry-choices, really... WASC, Edzo's and now BNG, all fresh-cut fries, within a mile or so of each other). Not rock-bottom prices, BTW.. just reasonable prices, comparable to most burger-spots, really (the cheeseburger plus fries is about 6, similar price to the excellent version from WASC for instance). The speciality burgers (kimchi, etc) were 6 bucks or so w/o fries. There were a few very interesting items on the menu, though, which seem well worth the try. auxen1 wrote: Excuse my ignorance but could you explain what a Kimchee burger is. Is it hamburger meat combined w Kimchee...does it create a unique taste....etc., etc. I'm not certain but I think my kimchee burger was a plain beef patty with kimchee (and a whole bunch more) on top. In this close-up I think you can make out the kimchee between the cheese and patty. In any case, I'm happy to hear you tried it and liked it. I think omitting the bacon and cheese is a good idea. I wasn't bothered by the fairly neutral cheese (I'm not sure it added a lot either) but I didn't think the smoky bacon meshed well with the rest. Maybe next time I'll simply pull out the rashers and have them as an appetizer. I'm really craving another kimchee burger now. Rene G wrote: I'm a big fan of bopNgrill. In spirit, it reminds me of Big & Little's, high praise indeed. Comparisonn to Big & Little proved motivation to try bobNgrill, and I see some comparison. Owner Will Song attended Le Cordon Blue/Chic and was sous chef at Sunda, yet another trained chef gone everyman. Short rib egg roll reminded me of national chain chimichangas, a boat of slightly over fried flour wrap with bland filling. Squirt of sriracha added interest though I'd be hard pressed to repeat even at $2. Luckily things took a quick turn for the positive. Kimchee burger was great, messy, drippy, juicy, contrasting texture and taste, quality meat, med rare as requested. Burger itself was plain, nothing mixed with the meat, toppings, including kimchee, were all add-ons. Best be hungry if ordering the Bob Plate Sampler, two scoops of rice, fries, really good fries at that, kalbi, BBQ (teriyaki), shrimp katsu. Enjoyed the rich meaty kalbi and tender chicken, shrimp didn't do it for me, simply a matter of individual taste. Empasis is on the food, decor is plain, chairs are plastic, but bobNgrill is clean as a whistle and floor to ceiling windows offer a tree lined street scape. bobNgrill first impression, Count me a Fan. I'm a fan as well. I went yesterday, for a quick sampling on my way to meeting some friends for dinner. I ordered their "surf and turf" burger which was advertised as a burger topped with cheese, bacon, barbecue sauce, and fried shrimp. After a bit of a wait (everything's definitely prepared to order here, so it takes a bit longer than your average fast food joint), my burger arrived piping hot, riding a giant boat of really excellent fresh-cut fries. The positives: burger meat was quite good. Definitely fresh, hand-pattied, very loose and crumbly, and seasoned well. Fries, as I mentioned, were a textbook version of fresh-cut, twice-fried spuds. The fried shrimp on my burger were also quite tasty; they seemed fresh as opposed to pre-breaded frozen, they were quite large and were fried perfectly and also piping hot. The negatives: these are quibbles. the cheese added very little--it was the "white american" that you get from Philly's Best. It's all melty ooze and very little flavor. It almost seemed like mayo. The bun they're using does not lend enough structure to these piled-on burgers, plus, they toast the heck out of it (which is nice, flavor and texture-wise), but it ends up falling apart much easier due to the softness that the toasting brings. Also, my burger didn't come with the advertised bacon or barbecue sauce. It was still damn good, though. This location is going to be a challenge for this guy. When I was there, he was having to deal with a large group of baggy-pants-wearing, gold-chain sporting gangsta wanna-be's who were just hanging around while one or two in their group ate fries. They were taking up nearly the whole restaurant and he was politely shooing them out ("you guys can't chill in here--I've got paying customers") so that I and a Korean couple could use the tables. The food that the couple at the table next to me was eating looked great. He had the kim chee burger and she had some kind of rice pile with fried spam, a burger patty, two fried eggs, and a bunch of other stuff. Eggs were perfectly cooked, everything looked really tasty. I didn't ask the owner about his culinary background, but he clearly has one, as evidenced by the very informed menu and well-turned-out food. I really like this place and wish them the best of success. The menu is really quite inventive and fun, in an Ameri-Korean-David-Chang-does-junk-food mashup kind of way, which I think is really cool. This place is a find. I'll definitely be back. elakin wrote: The menu is really quite inventive and fun, in an Ameri-Korean-David-Chang-does-junk-food mashup kind of way, which I think is really cool. Toss in a touch of Hawaii, too. Moco Loco is on the menu for my next visit. Yay bopNgrill! The Hays family finally made it over and enjoyed our meal very much - the owner, Mike, is as nice as could be. The food was very good, we're a bit spoiled for burgers and fries now in Evanston. We had a buddy with us, so he and Sparky shared a mac and cheese egg roll - the kids loved it - expectedly, though, it wasn't my thing. However, the mac and cheese on the inside of the roll was very, very good - nice al dente pasta in a nice cheese sauce, and the presentation was very arty, with a little trail of shredded cabbage punctuated by radishes and a swirl of sauce. We tried the kimchi burger, which I found to be kind of overtopped for my taste, although once I got to the center of it where it all came together I enjoyed it very much. It might be good to specify exactly what you want on it - I think the spouse ordered it with "everything" which meant ketchup, slab-o-tomato, fried egg, bacon, kimchi and shredded cabbage - and possibly some house dressing as well. The double angus bacon cheeseburger was equally heavy on the toppings; they use a very thick and chewy slab bacon. We also had the Korean Sampler: Kalbi, "BBQ Chicken" (dakgalbi,) shrimp katsu and a huge pile of shredded cabbage with an obviously house-made Thousand Island dressing and some white rice. I found things to be a bit on the sweet side for my taste, but heavy on the sesame oil, which I like - this is one of the better renditions of Korean BBQ in Evanston, though not up to the standard of Koreatown. The menu at BopNGrill has been slowly shifting over the past few months. They inadvertently created a 'secret menu' by removing a few things that early visitors may have ordered. My favorite of these is the El Spanish burger, a burger creation involving a fried pita and lots of themed toppings (I think Pico de Gallo is the most punctuated of them all). Unfortunately, one major change I discovered a few months back is that they no longer serve the perfectly done fresh-cut fries that complimented their burgers so well; in their place are what appear (and taste) to be Ore Ida specials, with a bit of oregano or something sprinkled on there for morale. The burgers and the egg rolls are really amazing, but I'm not sure I'll be back again given that competitors in the area can still deliver great fries. Went here today and noticed many changes that elevate this place even further... Waffle fries that were perfectly done, better than the ones even at chik fil a! Crisp, just the right amount of salt, and not greasy at all. I had the kimchee burger without the tomato and ketchup, and had them put in extra kim chee, what a flavor sensation! Also they are using prezel roll buns now for the burgers, which is a great touch and really adds to the texture and structure of these gigantic burgers, holding all this goodness in place. And the brownie egg rolls are a truly decadent way to end a meal here, a must try. BopNGrill is going stronger than ever, and judging by their overall yelp reviews, (average of 4.5 out of 5 stars thus far, with about 60 reviews) many are in agreement. eberon wrote: Unfortunately, one major change I discovered a few months back is that they no longer serve the perfectly done fresh-cut fries that complimented their burgers so well; in their place are what appear (and taste) to be Ore Ida specials, with a bit of oregano or something sprinkled on there for morale. I do think this is very much a place worth going back to.. went a couple days ago, and feel it had been way too long since my last visit. With the news about the fries, I actually stayed away from them this trip - just did a quick to-go order (though actually the waffle-fries sound worth trying.. perhaps next time). 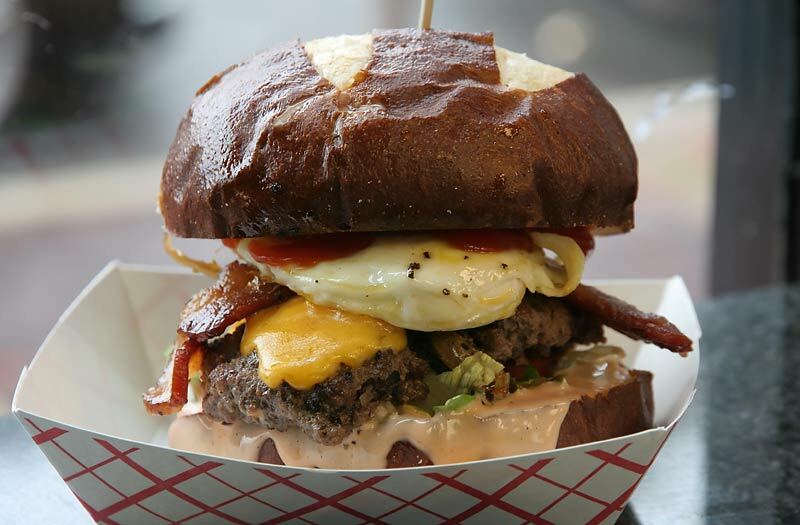 Just did a "loco-moco burger" to go.. the Hawaiian one, with fresh-beef, bacon, cheese, fried egg and gravy. It was a fantastic burger - Evanston is a land of wonderful burgers (WASC, Edzo's and Bopngrill), but this one would be as good or better than any found even in E-town IMHO. WASC has, IMHO, the best burger-fry combo in Evanston; Edzo's burger-fries are less to my taste than WASC.. but they offer a shake, which WASC doesnt. Bopngrill may not match either in their burger-fry combo (since I didnt try the waffle fries).. but as a pure burger theirs is quite excellent, it more than matches up.. and they offer a flavor-profile that is uniquely excellent (not just for Evanston, but for all of Chicagoland in some ways). Very much worth a stop. Went today for lunch. The waffle fries are really good; don't know if I'd go fresh cut fry good, but delicious, especially gravy style. The Hawaiian burger wasn't available, but they now offer pretzel buns for a buck upcharge. It's made it into the lunch rotation. They are not delivering now or taking orders on GrubHub since they are experiencing technical problems. I don't see the kimchee burger on the GrubHub menu and I don't know where else to find one. Does anyone know if this is still being offered? Looks like this might be lunch today. Wow, that kimchee burger was something else! I had it without the egg, since my egg-topped burger at Kuma's was unimpressive. The fries were nice and crisp and eventually had a nice glaze of sauce from the constant rain from the burger. I had a Groupon and the combo put me below the $10, so I ordered an Oreo shake to go. Not bad. I think I have a new naughty place to add to my repertoire. By the way, there is now an Umami burger: grilled tomato and onion, smoked gouda and bacon, and truffled duxelles. I had a hard time deciding between the two. I was in the neighborhood over the weekend and made my first visit to bopNgrill. It definitely won't be my last . . . I was struck -- and really pleased -- not only by the distinctive, offbeat combinations but also by how well they worked. 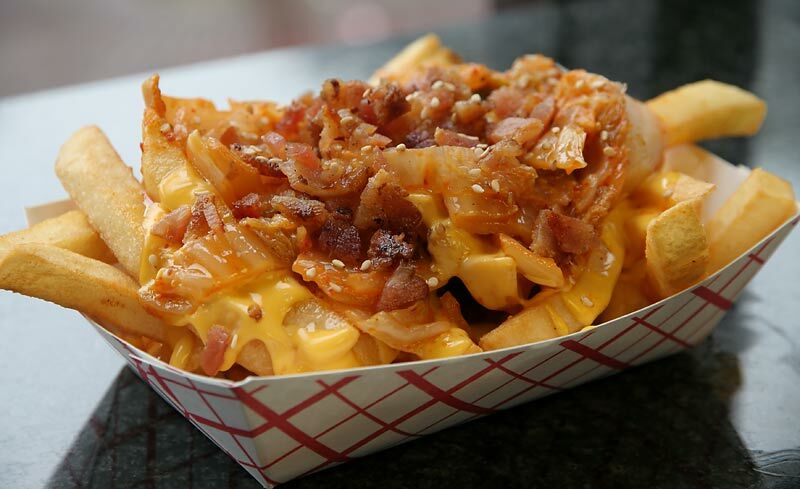 For example, I loved the way the bacon, sesame seeds and kimchi worked together on the fries. Ditto for the duxelle and smoked ingredients on the Umami Burger. As for the togarashi mayo, it's instantly become my new favorite condiment. Ingredients were fresh and delicious across the board. My only quibbles were the slight overcooking (to my preference, anyway) of the egg on on the BNG Burger and the patties on both burgers. I would have loved a runny yolk and just a bit of pink in those patties. Still, the combinations were outstanding, the flavors were compelling, and I'm eager to head back and try some of their other offerings. PSA: BopNgrill is sold out of the Umami burger today. Will tried to sell me a BNG, and then just as I was about to say OK, he mentioned that he likes the Moco Loco, adding the qualification, "but it's kind of heavy." I suppressed the desire to say, "Hello. I'm Sharon. Clearly, we have not met before." Instead, I told him not to worry about the heavy part and to give me a Moco Loco just as he'd order it. This was delicious even given the added sogginess of having to take the food back to my office. I would have liked more character to the gravy, and next time I'll maximize the use of the yolk and gravy for my fries, but I would happily eat this again. The fries were crisp but not my favorite given WSC and Edzo's in town. Next time, I might skip fries or, if I'm being really decadent, get my fries elsewhere before going back to work. 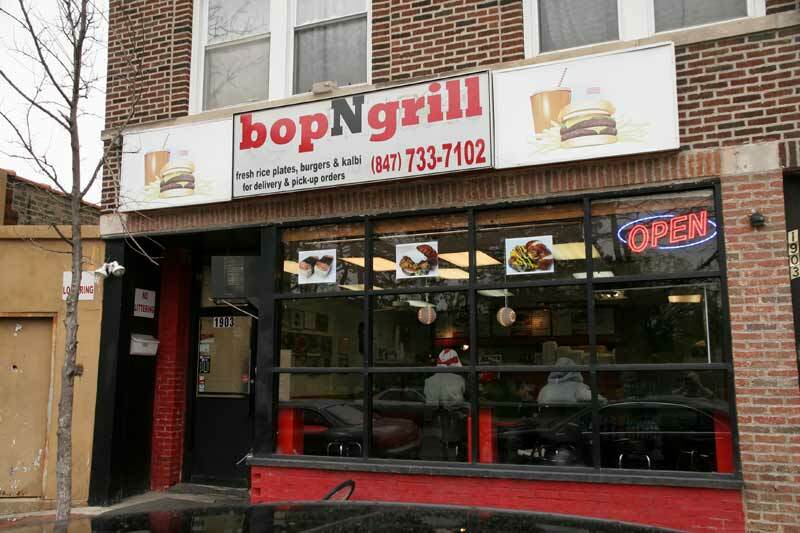 It'll be super if BopNGrill gets their second location in downtown Evanston. Last week he recommended a Moco Loco to me, and it was a deliciously soggy delight. The drippings while they would be good on top of fries, are best had picked up by their individual globules to be partaken in as is. Had the Philly Cheesesteak and Mac&Cheese eggrolls. The Cheesesteaks were phenominal as always, but the Mac&Cheese was a little dry for my tastes, maybe with some extra creamier cheese they'd be more my speed. Earlier, I railed on the fries, which have since changed again from fresh-cut to crinkle-cut (frozen?) to really good, potato-y fries that you see in recent photos. The owner is a really nice guy, always friendly and willing to chat for a while. I had a BnG wedged into a Pretzel bun today -- absolutely divine with the new pretzel bun (even without!). My wife had a double angus bacon which she really enjoyed. the full fry container practically forces you to eat over it (a change from the past when fries were only part of the container) -- as someone mentioned earlier this causes the juices of the burger to freshly run over your fries. It's really an amazing experience to have now and then. Total redemption on the fries front from my previous post. I recently tried Bop N' Grill again and unfortunately found that the kimchi burger I liked so much has been slightly tweaked with the addition of cheddar cheese and bacon. To be honest, I thought that the addition of cheese and bacon muddles the kimchi and gochujang flavor that I was expecting. The menu does not mention this change so please be aware before ordering. Went and tried the Umami Burger. It was really tasty but by the last few bites I was really wishing there would have been something acidic to cut through all that richness. It was almost too much. The fires were pretty standard fare frozen variety. Probably should have ordered the kimchee fries instead. I really want to get back and try some of the other items on the menu. Has anyone been the Rogers Park location yet? I tried searching and there does not appear to be a thread. I love the evanston location the several times I've been there, but no longer have a car so the RP one is much easier. I'm wondering if the menu/quality is identical. I was at the new location, though I have never been to the old. I cannot offer any menu comparison, though I had a sense it was roughly the same. I thoroughly enjoyed my first experience and would not need any arm twisting to return. Met the owner who is going back and forth between the two locations. His Mother is now making 75 pounds of kimchee weekly to supply both locations. One person with me has been to the old location. I believe he didn't notice any difference food-wise between the two. planmäßig wrote: I recently tried Bop N' Grill again and unfortunately found that the kimchi burger I liked so much has been slightly tweaked with the addition of cheddar cheese and bacon. To be honest, I thought that the addition of cheese and bacon muddles the kimchi and gochujang flavor that I was expecting. The menu does not mention this change so please be aware before ordering. 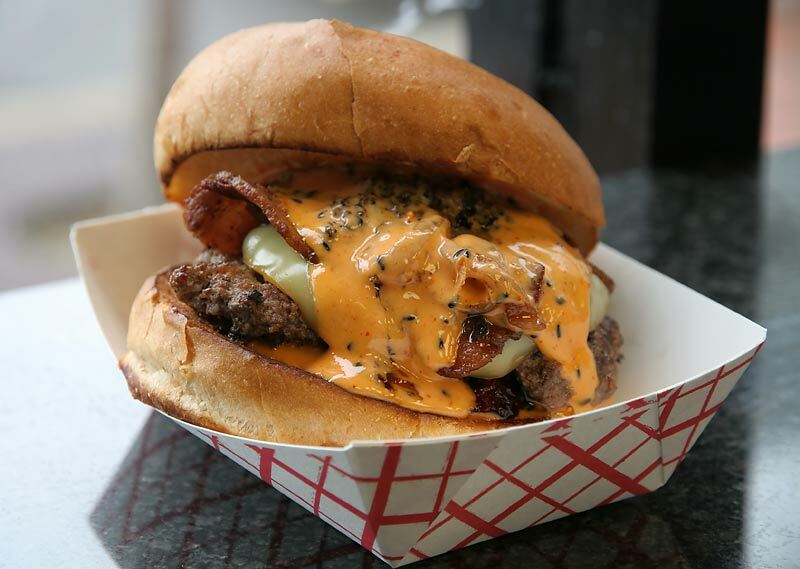 The Kimchi Burger I had recently at the Rogers Park location was quite similar to the first one I had in Evanston a year and a half ago (both included bacon and cheese). The current version of the menu lists both bacon and cheese. From top to bottom: tomato slice, shredded cabbage, fried egg, white cheese, kimchee, patted-to-order griddled burger, bacon, gochujang, all on a nicely toasted sesame seed bun. That's one crazy burger. There's an awful lot going on (perhaps too much) but I enjoyed it quite a bit. Maybe the messiest burger in memory, it was constantly squirting, oozing and dripping. Not a complaint. My recent burger had cheddar instead of white cheese, an unseeded bun and no tomato but otherwise was nearly identical (including the bacon). I have no problem with these changes. 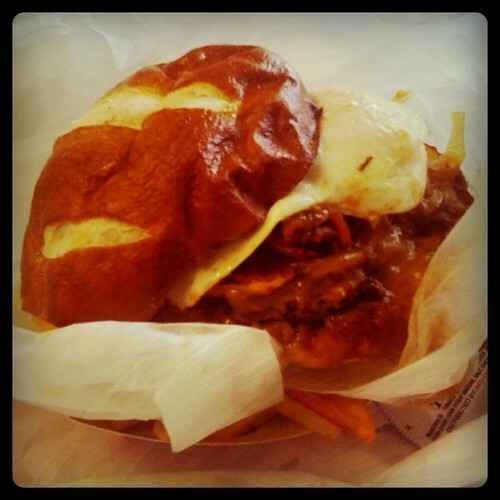 eatwisconsin wrote: Went and tried the Umami Burger. It was really tasty but by the last few bites I was really wishing there would have been something acidic to cut through all that richness. It was almost too much. I haven't yet had the Umami Burger but, speaking of rich, I had a taste of the Loco Moco Burger. The bacon, cheddar, fried onions, fried egg, mayo and short rib gravy almost puts it over the top. Almost. But somehow it's remains a well-balanced creation. Not sure I'd want one too often though. eatwisconsin wrote: The fires were pretty standard fare frozen variety. Probably should have ordered the kimchee fries instead. The fries were the only disappointment of my recent visit. They used to be medium-thick fresh-cut beauties but now they're nothing special. The optional toppings, here bacon and cheese, add interest. I'm a fan of bopNgrill, including the new location. Sparky and the Spouse had burgers with lots of toppings, plus the cheese/bacon fries shown above. We had a chat with the chef - apparently the students are only so adventurous, so they've decided to offer some standard fare to appease those palates. Sparky had a bacon and egg burger, which he very nearly finished, and the Spouse had the "Bavarian," bacon, cheese, onion, and mustard which was on a pretzel roll. Both my boys left happy, if not as ecstatic as I was. Pie Lady wrote: By the way, there is now an Umami burger: grilled tomato and onion, smoked gouda and bacon, and truffled duxelles. I had a hard time deciding between the two. I had this at our first-ever visit to BopNGrill (RP location) today. I had hoped to get a Umami and a kimchee burger for us so I could try both, but when I got out of the car, my husband issued an injunction against "anything weird," so that was out. He had a Bavarian (cheese, onions, bacon) and enjoyed its normality. I loved the Umami, but it was so one-note rich that I found myself wishing I'd had the kimchee instead. Fries were OK, but not worth finishing.